Son Heung-min scored in each half and Spurs went marching on as they recorded a simple, straightforward victory over Huddersfield Town. Now on a 17-match unbeaten run, this was a cruise for Spurs. Both goals were sublime combinations of teamwork and technique and there should have been more. Huddersfield, meanwhile, were far too meek until it no longer mattered. The hosts came to play, there was no doubt about that, with Mauricio Pochettino picking nigh on his strongest team. Their level was high from the off and you got the sense that Huddersfield would have struggled even had they been playing well. Despite recording back-to-back victories coming into this game, David Wagner's men were oddly listless in the first 45 minutes and allowed Spurs the freedom of Wembley. Son was the man who took greatest advantage, having himself a lot of fun on Spurs' left-hand side. 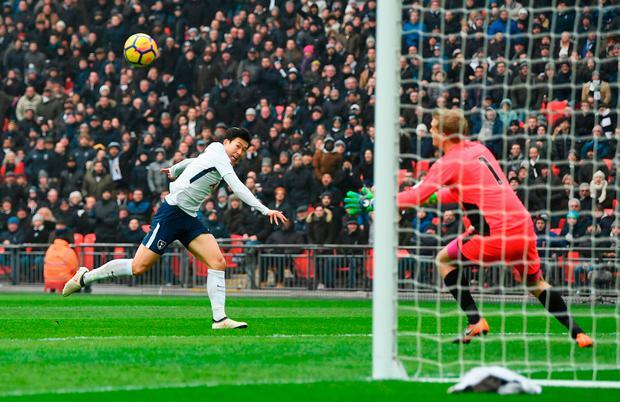 After both Dele Alli and Harry Kane had narrowly failed to get on the end of each other's crosses in the opening quarter of an hour, Son created the game's first chance for Kane in the 17th minute. It began with a sublime piece of technique, the South Korean deftly spinning Florent Hadergjonaj and sprinting beyond the petrified full-back. Son then whipped a cross to the near post, where Kane and Christopher Schindler contested it on the six-yard line. Kane got there first and connected with his left foot, but his shot was blocked by Jonas Lössl. It was a move typical of Spurs' dominant, confident play, and they went on to open the scoring just before the half hour. Rajiv van La Parra was robbed by Christian Eriksen in the Spurs half, and half-a-dozen touches later the ball was in the Huddersfield net. Eriksen's interception fell to Eric Dier, who chipped a pass forward to Kane, who chested down to Alli, who split the defence with a pass to Son, who rounded Lössl and finished off at the far post. It was perfect. Wagner reacted immediately by making a substitution, withdrawing the winger Collin Quaner for Tom Ince. Quaner had effectively been forced to play as a second right-back to counter Son and hadn't been having the best time of it. As the German walked down the tunnel he threw his gloves to the ground in disgust at a thankless task left incomplete. 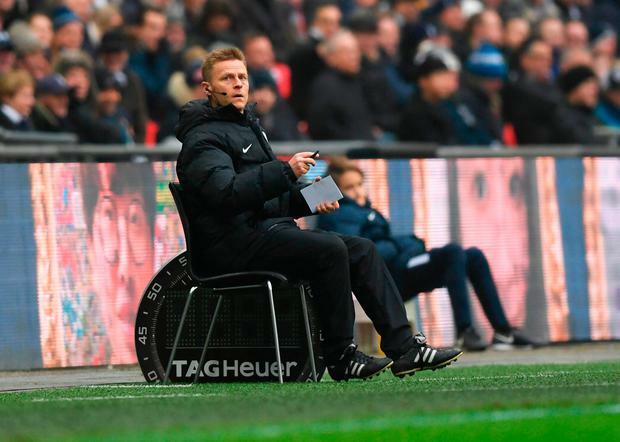 Alex Pritchard also left the field before half time, Huddersfield's record signing forced out with a thigh injury. Even with 45 minutes remaining it did not seem likely that Huddersfield could rouse themselves from their position, so timid had been their performance up to that point. They did at least inject some vigour into their game after the restart, for five minutes anyway, as Tom Ince led a couple of counterattacks that forced a first corner and shot on target (Ince's own effort, dealt with comfortably by Hugo Lloris). In another blink of an eye, Spurs then doubled their lead. Again the move began with a turnover, and again it was La Parra who lost it, forced into a misplaced pass by Alli before the ball was shuffled over the halfway line to Kane. The England man then simply got the ball out of his feet and whipped a cross 35 yards to the back post where Son, running in, headed it home on the bounce. It was only Son's second headed goal for Spurs and his celebration seemed somewhat muted by shock. Son was replaced with 20 minutes remaining, Mousa Dembélé with 15, Alli with 10, as Spurs eased their way to victory. This was a comfortable, encouraging warm-up ahead of their Champions League decider with Juventus on Wednesday, and a performance in which everyone played their part. The attacking quartet, in particular, were purring, while Ben Davies and Serge Aurier were also imposing in the full-back positions. All that was lacking was a 25th league goal for Kane, who had one more chance to extend his lead in the race for the golden boot but volleyed wide from a corner. Aidan Fitzmaurice Occupying second place in the Premier Division could be seen as nose-bleed territory for a club like Bohemians who have not won a trophy, or even challenged, in a decade. Independent.ie Sportsdesk Ireland's No 1 Darren Randolph has been selected on the Championship team of the year after 19 clean sheets in an inconsistent Middlesbrough team.